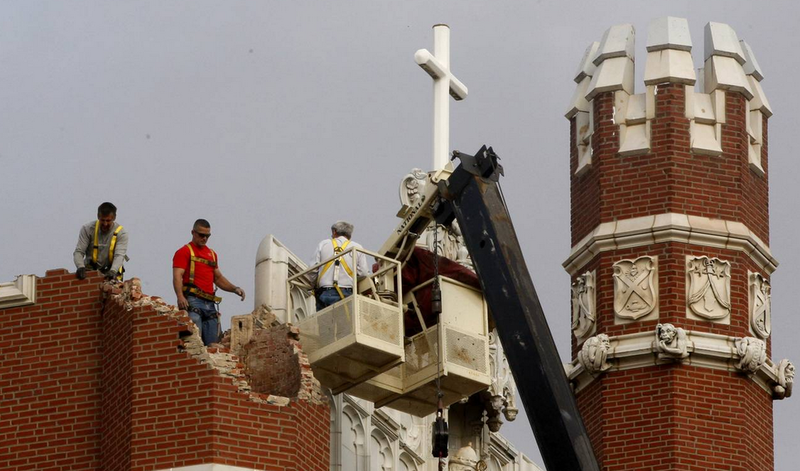 Maintenance workers in 2011 inspect damage to Benedictine Hall at St. Gregory's University following a magnitude-5.0 earthquake in Shawnee, Okla. The number of earthquakes in Oklahoma has fallen 25% in 2016 compared with a year earlier. Disposal wells have been blamed for a surge in earthquake activity in the state over the past decade. Earlier this year the Oklahoma Corporation Commission increased efforts to get companies to reduce the amount of wastewater they inject underground. The efforts to ease wastewater disposal came after the oil-and-gas industry faced multiple class-action suits as a result of the quakes. “The directives by the Oklahoma Corporation Commission to reduce wastewater disposal volumes are showing results,” said Chad Warmington, president of the Oklahoma Oil & Gas Association.